Cincinnati’s aggressive efforts to bolster bicycle infrastructure appear to be paying dividends. In a report released by The Atlantic Cities, it was discovered that Cincinnati has experienced a 200 percent increase in those commuting by bicycle over the past decade. The study found that many cities across the United States, particularly those in the Northeast and Midwest, experienced rapid increases in the number of bicycle commuters. 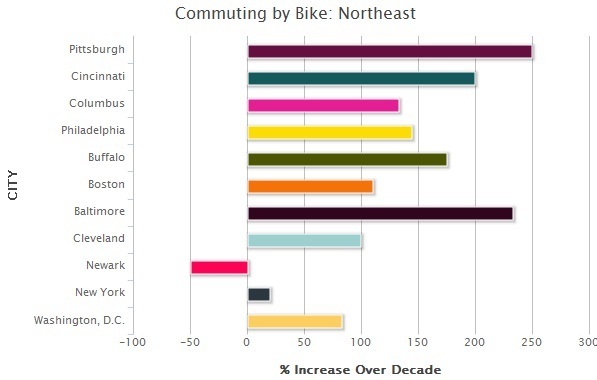 Commuter bicycle growth from 2000 to 2009 – Source: The Atlantic Cities. While Cincinnati saw one of the fastest growth rates in the entire nation, it also now boasts the fifth highest overall percentage of bicycle commuters in the Midwest. Only Columbus, St. Louis, Chicago and Minneapolis have a higher percentage of bicycle commuters than Cincinnati. That news was further punctuated Cincinnati’s “Honorable Mention” at the 2011 Bicycle Friendly Community awards held in Washington D.C. At the awards, only 22 cities were recognized nationwide. 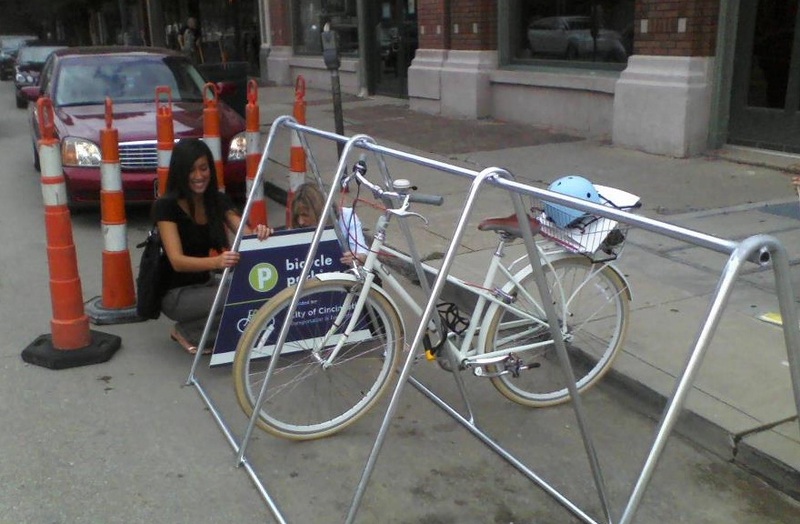 Temporary on-street bicycle parking for the MidPoint Music Festival – Source: Queen City Bike. City leaders believe the wave of good news comes as a result of significant policy decisions made over the past several years that have included new on-street bicycle parking; passage of comprehensive bicycle safety legislation, legislation requiring bicycle parking in all new parking garages, and a comprehensive bike plan; the launch of a Bicycle Friendly Destinations program; the construction of a new Bike & Mobility Center at the Smale Riverfront Park; and the completion of new bike lanes, sharrows, and bike trails throughout the city. Recent decisions to install temporary on-street bicycle parking for the MidPoint Music Festival seem to further emphasize the city’s prioritization of the two-wheeled mode of transportation. In total Cincinnati city officials plan to have 340 miles of bike lanes and paths in place by 2025. Currently the city has only 20 miles of bike lanes and paths in place, with five of those miles being installed over the past year. Future plans call for completing the remaining segments of the Ohio River Trail and adding additional miles of sharrows, dedicated bike lanes and paths. For comparison, an infusion of money similar to that of the Brent Spence Bridge project ($2-3 billion) would enable the construction of roughly 20,000 miles of dedicated bike lanes, and pay for their maintenance.